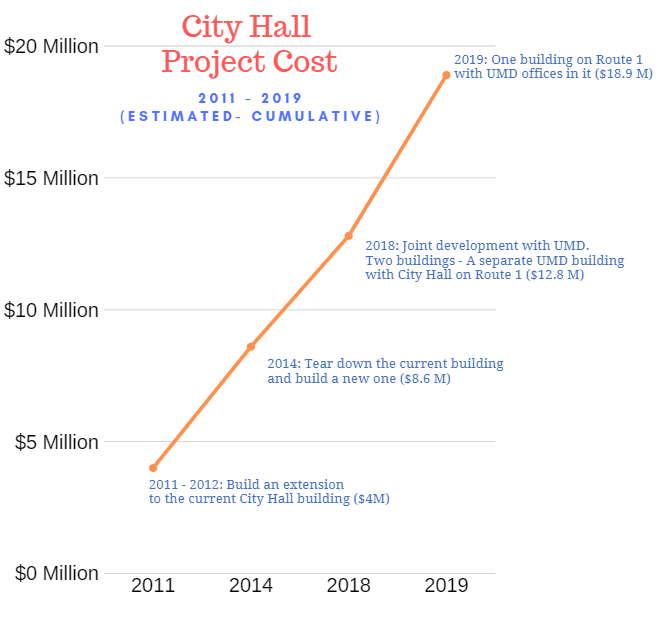 If built on the latest design, the City Hall project is the most expensive project that the City has undertaken since its incorporation back in 1945. What started out as a $4 million project back in 2011, is now estimated to cost nearly $19 million to complete, according to the FY 2020 draft budget, which was published last week. For many years, there have been many discussions about the future of the existing building on Knox Road to accommodate the space need of our City staff. The existing Building on Knox Road is 12,498 SF. Back in 1990, a consultant analysis projected that 18,000 SF deficit by 2005, to meet the growing need of a larger City Hall. In 1996, the current building was extensively renovated. In 2003, the City issued an RFP (Request for Proposals) to real estate developers for a downtown parking garage and the City Hall redevelopment project. At that time, several sites were evaluated for the relocation of City Hall but ultimately the proposed private sector development on the site failed to move forward and only the downtown parking garage was built. In May 2011, City staff decided that the most expedient and cost-effective solution to address the space need is for the City Hall to remain at its present location and be expanded. Accordingly, the City secured Frederick based construction and architectural company Profitt & Associates P.C. to look into this expansion and renovation work. According to the project proposal, it was estimated to take about 12 to 16 months to complete the project. In February 2012, the City Council discussed the project further. The idea was to keep the current 16,670 square foot building and add an extension of 25,460 programmed square feet and 2,900 square feet for future expansion and storage. Please see above a rendering of the proposed design. The recommendations included: (1) Remodel the basement and first floor and leave the Council chambers largely intact, but replace the windows and the air conditioning to allow for greater efficiency; (2) Build a three-story addition with a green roof for a new lobby, office space, and meeting rooms. Out of the $3.68 million total expenses, $2.72M was expected to be spent on the new construction of the addition and the remaining (.96M) was to be spent on the renovation of the existing building. Later in 2012, the renovation/addition plan was put on hold. 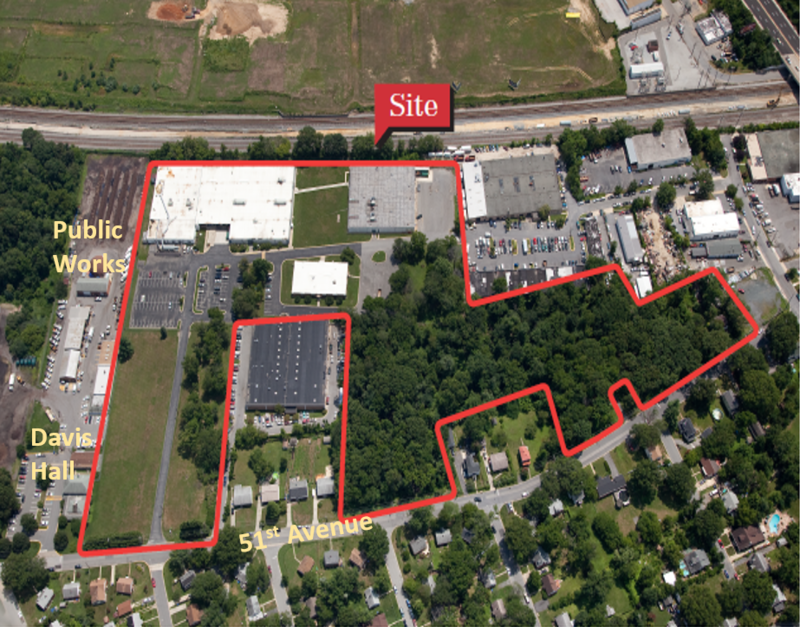 The decision was driven by two reasons (a) Possible availability of Route 1 frontage and opportunity to work with the UM Foundation on other options and (b) Availability of 4601 Calvert Road site, where our current Public Services office is located. (1) The current Knox Road site: This includes tearing down the site and rebuilding a new building there. City staff made a presentation about two options. The cost to rebuild the City Hall at the Knox Road site was estimated at $7.9 million. 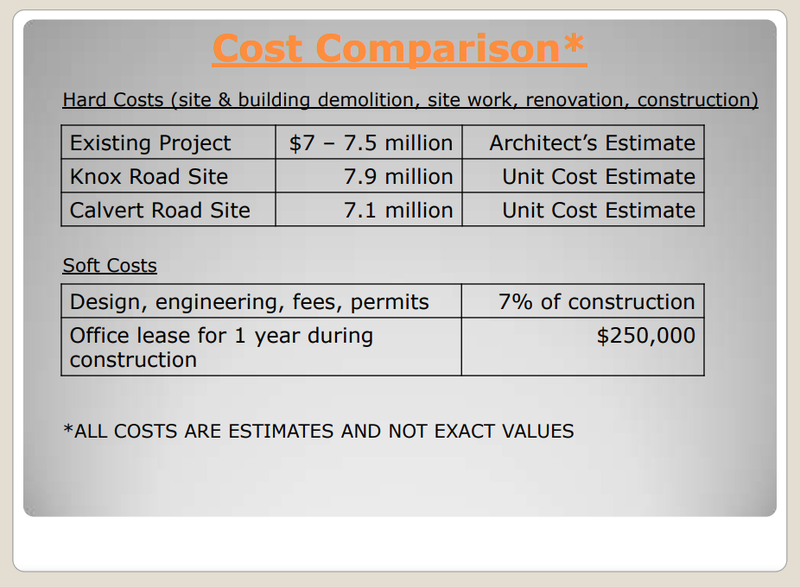 Please see the slide comparing the costs in two options. The cost figures include the costs for site and building demolition, site work, renovation and construction. On November 11, 2014, the City Council discussed briefly about another possible site – the Stone Industrial site, located just south of the Public Works building. The site came to the market around that time. The assessed value of the Stone Industrial site was about $5.65 million. The site (please see below) had 3 buildings in 17 acres of land (compared to 1.23 acres of Knox Rd site and 3.73 acres of the old Calvert Rd school site). You can see more about this site here. At the meeting, a request was made if staff can be authorized to spend some time in putting together a fact sheet about the site for the Council consideration. Unfortunately, that request was rejected. On November 24, 2014, the City Council selected the current Knox Road site to build a new City Hall there. A motion to table the vote to consider all possible sites (including the Stone Industrial site) was defeated by 5-3. 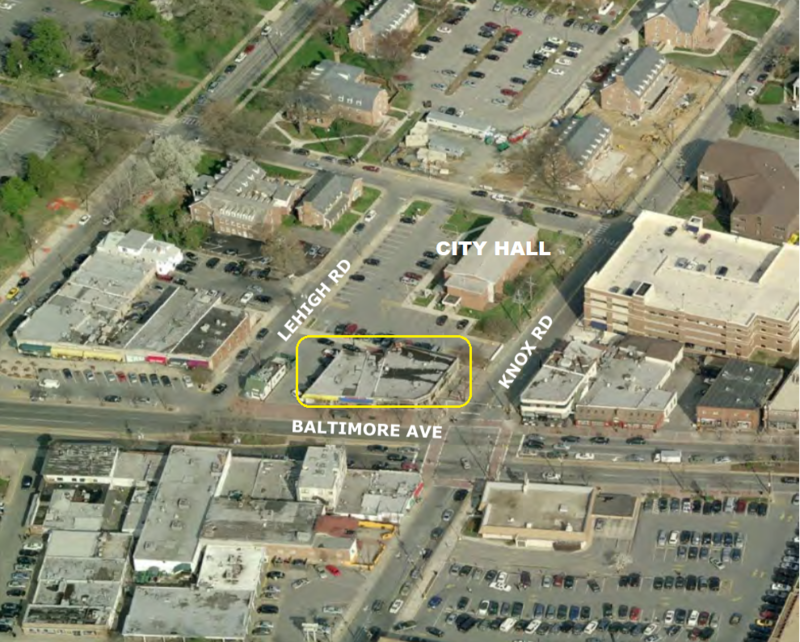 In 2015, City staff and the University of Maryland held a meeting to review design options for a joint development on the City Hall block between Baltimore Avenue and Yale Avenue (please see below). two buildings joined by a common atrium. 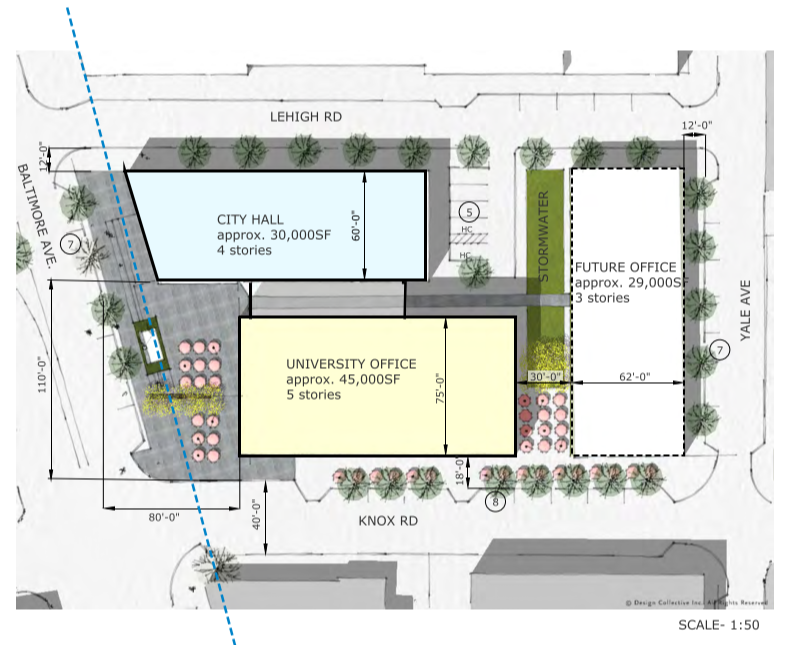 A single building with a 30,000 SF City Hall and a separate 45,000 SF of university offices would be built next to the new City Hall. A significant public plaza would occupy the Route 1 frontage and approximately 10,000 SF of retail could be accommodated initially on the ground floor of the university offices. A small amount of surface parking would be provided on site with most of the parking provided in the existing garage. At a November 2017 meeting, the City Council introduced an ordinance authorizing the acquisition of properties located at 7409 and 7411 Baltimore Avenue (Route 1) using eminent domain. These properties were owned by Mrs. Margaret Jeanne Kurz Byrd of Melbourne Beach, FL. City Staff had been in discussions with Mrs. Byrd and her son, William Byrd, since October 2016 concerning the City’s interest in acquiring these two key parcels of land. Unfortunately, these discussions had not resulted in an understanding between the City and the Byrd family. In the end, the City did not need to use the eminent domain option. The City and the seller (Mrs. Byrd) entered into a purchase agreement. Businesses on the block were affected by the acquisition. At the March 2018 meeting, the City Council approved an agreement of sale to purchase property located at 7409 and 7411 Baltimore Avenue for a total price of $1,600,000. The sale would allow the City to move forward with redevelopment of the current City Hall block. 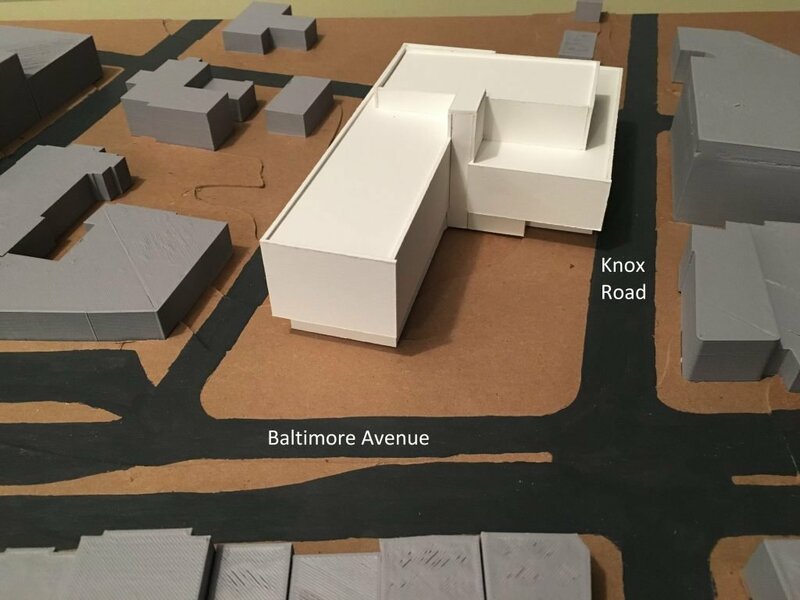 At the November 2018 Council meeting, the new City Hall architecture team presented a concept plan of the new City Hall building that will include University of Maryland offices in it. Please see below a model of the proposed 3-D model the architecture team presented at the meeting. According to the new design, there will be retail on the lower levels and University office space on the third and fourth levels. Additionally, as of February 2019, the City accumulated a total of $315,900 through other funding sources. These sources include State Bond, Community legacy grant, inter-project transfer, and rents from the stores on the Route 1 property acquired. With these additional funding sources, the current total figure for the cumulative funding sources is $5,846,310. With the proposed borrowing of $12 million, the estimated total cost may hit at $18 million mark. In the draft FY 2020 budget published in March 2019, the total figures are estimated at nearly $19 million. Please see below the details of that estimate . What does the borrowing a large sum of money for the City Hall project mean? Financing $12 million and $16 million will increase City’s debt service to operating expenditures ratio from the current level of 3% to nearly 8% and 10% respectively. The current 3% debt service ratio reflects the debts the City is carrying for the downtown garage project. Please see below the graph presented by the financial advisers at the Council meeting. It’s recommended to keep this ratio under the 10% level, thus financing a large amount now will severely limit other potential major capital projects in the near future. The City Council has made the building of the City Hall as one of its top priorities. It has yet to approve the detailed construction design, and decide how much it should borrow to support the construction and related costs. Update (3/20/2019): Since this article was posted two days ago, I’ve received a few good feedback from the readers. Please see below my comments about these feedback. I’m incredibly grateful for these comments and feedback. 1. The 2014 cost figure in the graph has now been updated to include the soft cost and the cost for office lease. 2. A section is added at the end of the post to describe the current status of the project. 3. It has been suggested that we should “exclude” several major cost components from the City Hall’s overall project cost. They include (a) the price ($1.6 million) we paid to buy the Byrd property on Baltimore Avenue, as we “may” get some part of this cost back after negotiating with the UMD (b) the debt service cost we are going to pay to borrow money for the project and (c) the studies we did for the project. I strongly feel that they should stay in the budget’s CIP page as they exist now. If you have any further comments, please let me know. Thank you. With all the coming development directly and indirectly related to the Univ of MD, the city’s commercial tax base should should continue to expand at a healthy rate, generating property tax revenue growth. The City’s parking garage debt is financed from steps taken to increase parking revenues 10 years ago. This debt has about 12 years to go, but it could be paid off at a more aggressive rate. Bob, Thanks for your comments. It all depends on what residents want in the near future. For new large capital projects, we’ll most likely have to sit tight for several years and wait.